Premature infants can benefit significantly from simple hugs—that's why this new program aims to leave no child unhugged. We've all found ourselves really, really craving hugs from time to time—but for infants born prematurely, it goes far beyond that. While skin-to-skin contact is beneficial for all newborns, it's especially important for the 380,000 infants born prematurely here in the U.S. each year. "Research shows that hugging babies can do more than calm a cry. Hugs can help keep a baby’s heart beating at a normal and constant rate, improve sleep, support healthy weight gain, and lead to an improved parent-baby relationship, according to a recent Huggies study titled The Power of Human Touch for Babies," Geoff Golub, the senior brand manager at Huggies told Fit Pregnancy via an emailed statement. The unfortunate reality, though, is that moms can't always be by their premature infants' sides in the NICU, especially if they're hospitalized for weeks or months. If you've ever been in this situation, you know it can be heartbreaking. 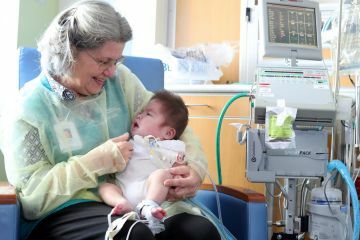 That's why Huggies has rolled out the "No Baby Unhugged" inititative, a program that works to ensure babies in neonatal intensive care units get the care they so desperately need. Chicago's Ann & Robert H. Lurie Children's Hospital has become the first to earn a grant from the newly launched inititative, and they'll receive a training program and support from Huggies to implement it for their NICU's patients. While the Chicago hospital is currently the only one to offer this specific program, Huggies hopes to partner with other hospitals around the country. That'll bring more hugs—and hopefully, better outcomes—for more babies across the country.